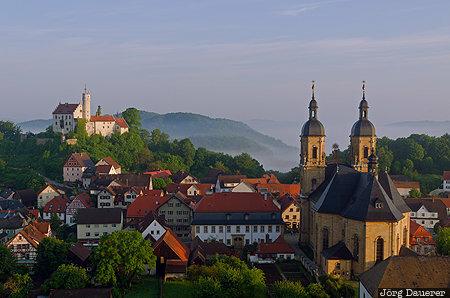 The basilika of Gößweinstein (Pilgrimage church of the Holy Trinity) at the right side and Gößweinstein Castle in the background illuminated by warm morning light. Gößweinstein is in Upper Franconia (Oberfranken) in the north of Bavaria, Germany. This photo was taken in the morning of a sunny day in June of 2013. This photo was taken with a digital camera.